Apparently Robby Anderson was not slowly being phased out of the offense and his ability to take the top off the defense still exists. Despite playing a season-low 51.61-percent of the snaps, Anderson caught two long touchdowns (TDs) on five total targets. For the season, even after his dominant Week 4 performance, Anderson has still been targeted exactly zero times in the red zone and just once in the end zone all season long. Essentially, starting him takes some guts because he has only played almost exactly two-thirds of the snaps and his value comes from long receptions. The top one-percent outcome happened on Sunday this week when the Jets averaged an NFL season-best 8.4 yards per play and Sam Darnold managed 9.0-plus yards per attempt (YPA) for the first time since Week 1. 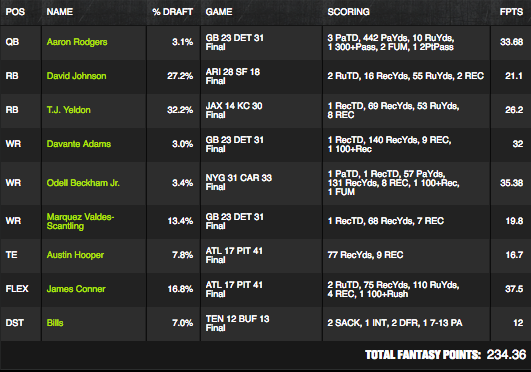 This Anderson performance propelled players on FanDuel specifically to massive paydays. In Week 1, the Buccaneers stack took down both sites (20 implied points) and in Week 2 the Vikings’ double stack won all the money (23.5 implied points). In Week 3, the game with the highest implied total (over/under of 54 at closing) finally lived up to its billing, and last week the Bears (24.5-implied points) took everything down. This weekend, the Eagles’ QB/TE stack (25.75-implied points) with no Vikings runback propelled a lineup to the top. Being contrarian is one thing but stacking teams with low totals is not proving to be a profitable strategy even from a contrarian angle this year. Onto our NFL DFS GPP Recaps. The play that stands out here, other than the 1.5-percent owned Anderson, was a 4.0-percent Aaron Rodgers. Although Marquez Valdes-Scantling was 22.0-percent owned, very few decided to use him as part of a Packers team stack, which led to Rodgers becoming a solid leverage play. Furthermore, this lineup chose to use Golladay to run back the game stack, which is a strategy that has won these secondary contests every week (three-plus players from the same game). After the WR in the QB/WR duo from the winning lineup (in the secondary contest analyzed) did not score last week, the winning lineup once again featured a QB/WR TD (which should prove to be the norm over a larger sample size). Last week was my biggest week in DFS. While I had grinded out $20,000 scores previously in PGA and qualified for a NHL Live Final, I had never flirted with a six-figure payday. From 4pm until 7pm I was winning more than $100,000 on DraftKings in the $3 20-max with a lineup that would have been leading the Millionaire Maker until Todd Gurley II went HAM, the Cardinals Defense scored a touchdown and Zach Ertz found the endzone with the game just about out of hand. Ultimately that swung me down to $25,000 before a C.J. 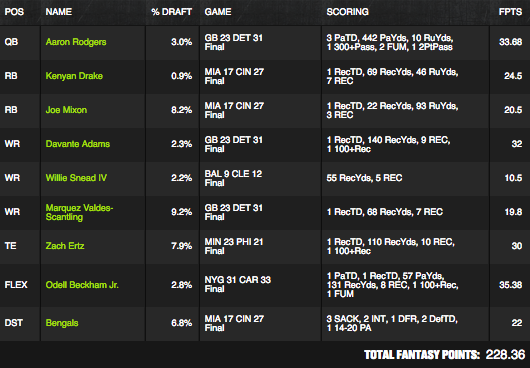 Beathard garbage time QB sneak drove me back up into 2nd place for $50,000. The same lineup also won the $8 three-max and a $10 150-max GPP I had entered, in total grossing more than $70,000. 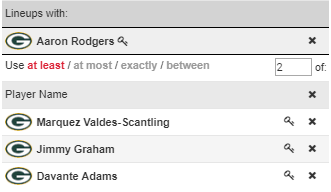 I’ve been calling for people to employ three-man stacking since 2016 and the lineup below did just that, pairing up Packers QB Rodgers with the discount double stack of Davante Adams and Valdes-Scantling and “bringing it back” the other way with Detroit WR Kenny Golladay. This lineup also rotated in some of DailyRoto’s top value backs Conner, Yeldon and Christian McCaffrey, as well as Austin Hooper. With so many people focusing on game stacking the passing attack in Atlanta and Pittsburgh, I was able to grab 3% owned players from one of the highest total games on the slate, and still grab Pittsburgh exposure in Conner and Falcons exposure in Austin Hooper. In total my player exposure aligned very closely with our top values with a couple of notable exceptions. Kenny Golladay. When Marvin Jones was ruled active but injured, I decided to bump the market share of Kenny Golladay vaulting him to one of the top values of the position. I still ended up with a competitive amount of Marvin Jones Jr (13% of entries) but was able to get well overweight on Golladay and Tate. Tyler Lockett. For similar reasons I wanted to grab more exposure to Tyler Lockett than Doug Baldwin, though I played both of them. I was also able to get big production from low ownership on Mohamed Sanu and Austin Hooper, and certainly whiffed on a few punt spots like 34% Jeff Heuerman exposure. You can’t win them all. 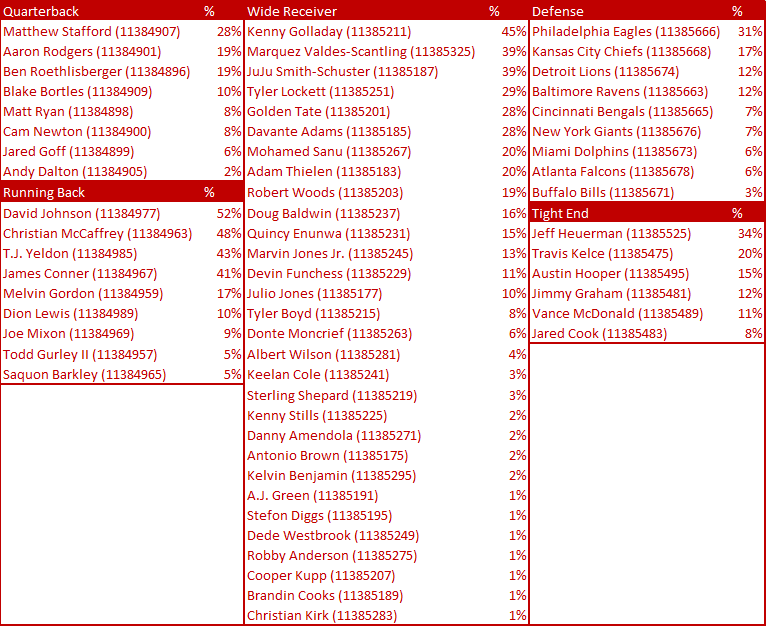 In fact, if you configured QB – 2 Pass Catcher – Opposing Wide Receiver stacks these results were very optimal. Leveraging our GROUPS feature, I was able to ensure that all my Aaron Rodgers lineups were double stacked knowing that if he threw 3 TDs it was extremely likely that two of MVS, Graham, and Adams would return value on their salaries, as the Packers were missing Randall Cobb and Geronimo Allison. 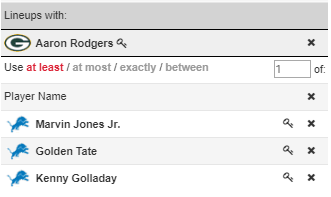 Similarly, Detroit was likely to generate high performing wide receiver games if they were in a shootout, so all of my Rodgers lineups included Golladay, Marvin Jones or Golden Tate. While it was close to a $100,000+ score, it was still an incredible day. 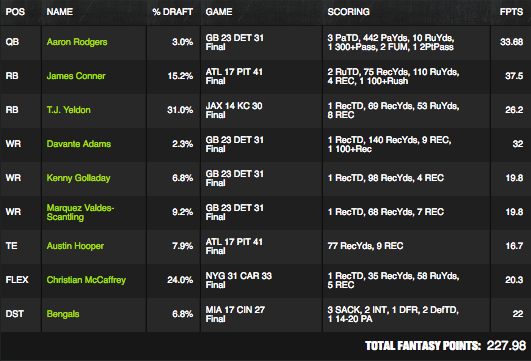 Furthermore, these lineups were lineups that any of our subscribers could have generated. The DailyRoto content team does such a good job of putting together competitive projections that I was able to focus on configuring my groups and lineups so that they told the right story. So many weeks I see people obsessing over projections despite the fact that our team has put dozens of hours from four plus people into them. Instead of obsessing over values, I was able to make a few minor edits take a couple of shots on high-value contrarian spots. After nearly 5 years of grinding DFS those shots finally paid off, and if you stick to your process they can for you too. The first thing that stands out in his builds is the attention to the Packers/Lions game stack. His top six exposures include five players from that single game. This level of bold had not been analyzed in the piece thus far and shows a player who is willing to let it ride on his strongest opinion(s) of the week. Either he is going to have a week where he finishes with multiple lineups in the money or he is going to totally tank. It is easy to appreciate a strategy like that when it works but it can easily backfire if game flow goes awry or a player gets injured. This week, a lot went right for rikkidee in the game he focused on so he natrually finished quite profitable, with his best entry netting him $7,000. The bottom of his list featued three duds: Enunwa (0 fantasy points), Stills (3.7 fantasy points) and McCoy (12.23 fantasy points). Still, he was able to overcome because he focused on the highest scoring QB of the week and his top two weapons.